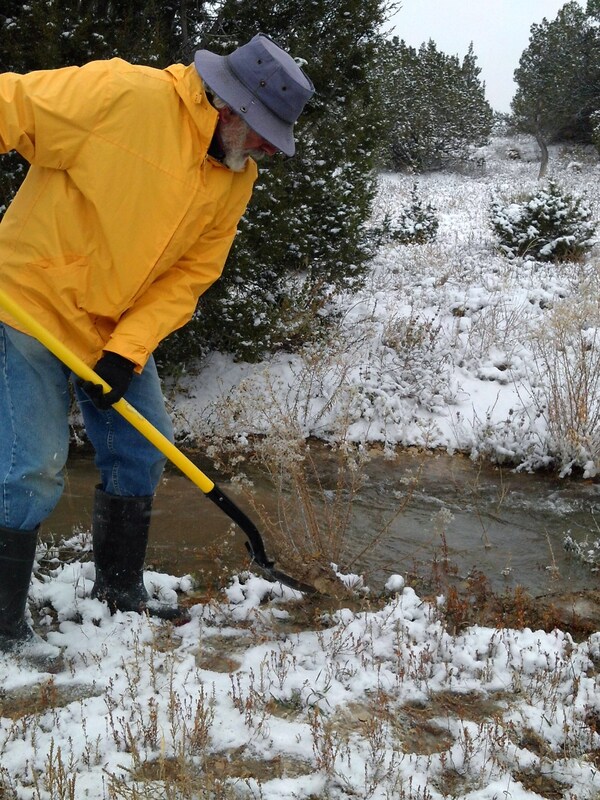 If you haven’t tried to distribute irrigation water in winter, you just haven’t lived. 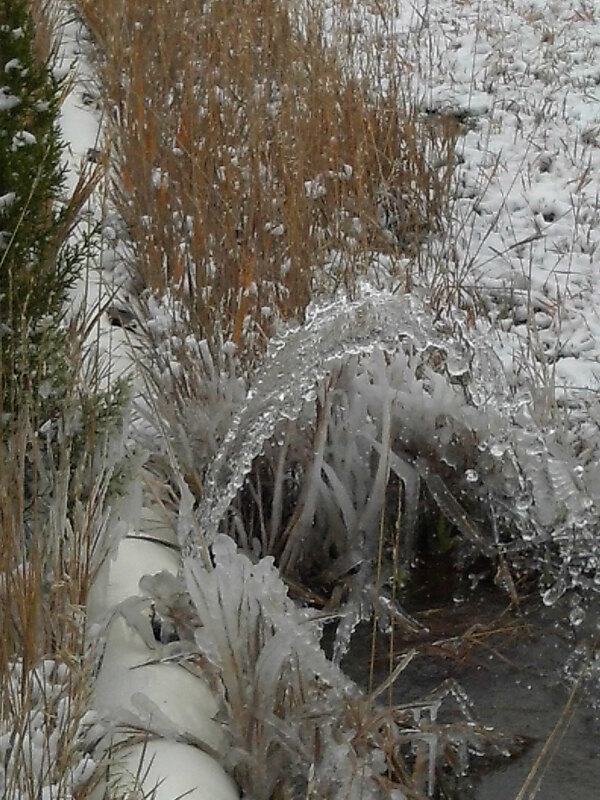 If you don’t depend on irrigation water yourself, you probably think that anyone who would irrigate during a minus 8-degree cold-snap is nuts. Perhaps we are, but the cardinal rule is “Never say ‘no’ to irrigation water.” Your mother may have died, but irrigating takes precedence over funerals. Following a long drought in Penrose, we were delighted to have three good irrigations this season. This most recent irrigation was the icing on the cake. Given that we do not have thousands of acres or depend on the land for subsistence, you might wonder why we would want a fourth irrigation. 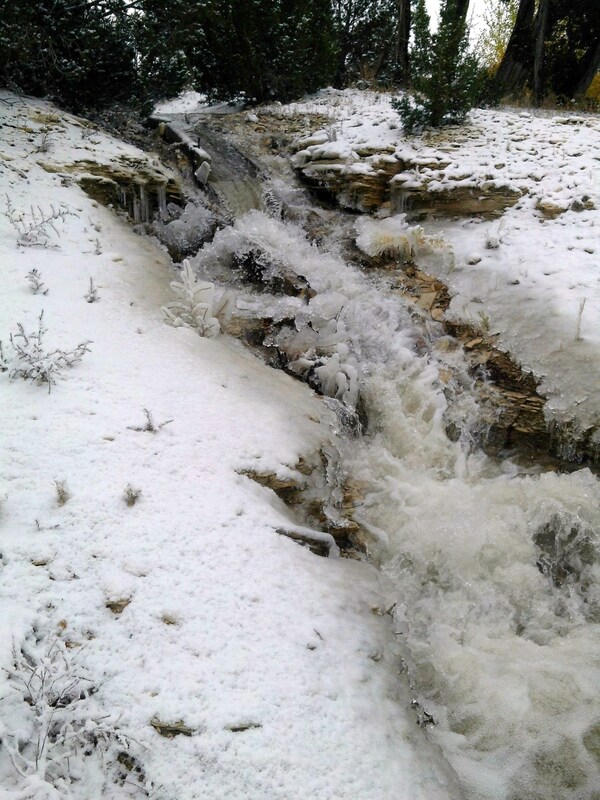 Who in their right mind would bother to irrigate a mere eight acres in freezing weather? When the kids left home, when we butchered the cows, sold the horses, and moved up the mountain to Westcliffe, we retired from our small hobby farm. Which is not to say that we retired from the land itself. At this point, with an eye to a future real estate sale, we are preserving the fields as an asset. In addition, we are providing wildlife habitat. Let’s plant milkweed and save the Monarch butterflies! A double head waterfalls down from the headgate. I like the back-to-basics, primal nature of irrigating. But I’m not so keen on… wait wait! The story unfolds. When our children were young, we thought it important to teach them that beef and eggs did not come from the grocery store; rather, the meat on our table came from our cows. The eggs (as well as the meat) came from our ducks. Thinking that we could prepare the children for the harsh reality of selling their feed-lot, bottle-fed babies for slaughter, we gave our cows names that suggested their ultimate destination. We named our first feeder-calf, Burger. Our next calf was Whopper. Short Ribs came next. We thought that we could prepare the children. I never thought to prepare myself. Burger was the first to go. Not having a stock trailer at that time, I called a neighbor. Would he, I asked, transport our cow to market? Yes, he would, and on the appointed day, he drove down our dirt road and stopped by the pasture gate. Blissfully unaware, Burger (the sweet one with the incredibly long eyelashes… the one who was always ready for a scratch behind her velvety ears) was grazing at the far end of the field. A double head… frozen gates… this is the life? Just how, the cowboy wondered, did I plan to get the cow in his horse trailer? I answered that I would call her. The smirk on his face was meant to put me, an inexperienced, hobby farmer, in my place. Unfazed, I climbed in the back of the trailer, cupped my hands to project my voice, and called, “Burger!” I used the same sing-song voice that I would have used to call the kids in from play. Typically, cows don’t hurry, they poke. But hearing my call, Burger ran across the field and without a moment’s hesitation, jumped in the trailer with me. His was a sobering question. Surprisingly, the children took Burger’s demise in stride. I was the one who truly suffered. I’m through with home-grown livestock. I’ll irrigate (after the weather warms and before rattlesnake season) but for me, it is all about providing habitat for wildlife. Bring on the birds and the butterflies. This entry was posted in Uncategorized and tagged habitat, homegrown beef, irrigation water. Bookmark the permalink. You ate Burger???? That said, I have a roast about to go in the oven so who am I to talk? Dear Detour, I did eat Burger, but I don’t think that I could eat home-raised beef today. I am more emotional and attached to living animals. If I am to eat meat, I need the emotional distance of buying meat that someone else has killed. If I were a “good” person, I would eat no animal products at all. I eat some meat… not a lot but “some.” I carry around a lot of guilt.